walking up my street yesterday, with my eyes on the ground, i found my wandering thoughts interrupted by something familiar. 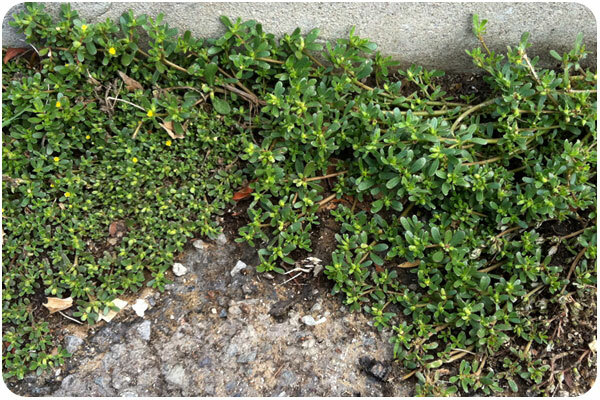 hey, isn’t that purslane—growing right there in the gutter? either purslane is everywhere suddenly, or i am finally aware of it enough to realize people everywhere are talking about this plant. a summer favorite at farmer’s markets, purslane is an edible succulent that only grows in warm summer soil [often thriving in poor quality soil, too] and full sunlight. it’s often been called a weed, since it is quite hardy and has a tendency to spread with a near-indestructible root system that stands up to breakage and root dividing. it’s also just an annual, so allowing it to have its summer season won’t ruin your garden for fall. in fact, it won’t ruin it at all—purslane is a great ground-cover that keeps soil moist, pulling deep water to the surface and hydrating companion plants. moreover, though, purslane is good for you! i was just reading about its superfood qualities: Purslane contains more omega-3 fatty acids (alpha-linolenic acid in particular) than any other leafy vegetable plant. 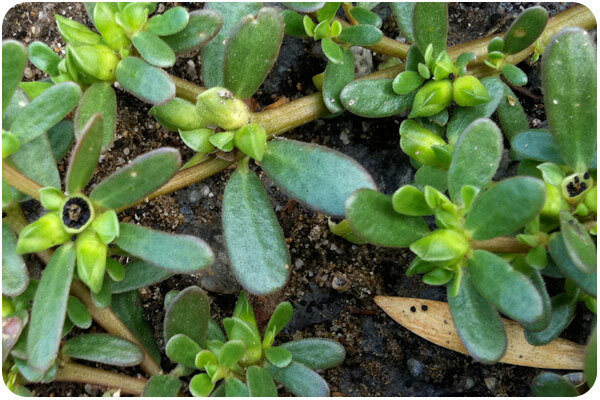 Simopoulos states that Purslane has 0.01 mg/g of eicosapentaenoic acid (EPA). This is an extraordinary amount of EPA for land-based vegetable sources. EPA is an Omega-3 fatty acid found mostly in fish, some algae, and flax seeds. It also contains vitamins (mainly vitamin A, vitamin C, and some vitamin B and carotenoids), as well as dietary minerals, such as magnesium, calcium, potassium, and iron. Also present are two types of betalain alkaloid pigments, the reddish betacyanins (visible in the coloration of the stems) and the yellow betaxanthins (noticeable in the flowers and in the slight yellowish cast of the leaves). Both of these pigment types are potent antioxidants and have been found to have antimutagenic properties in laboratory studies. read more on wikipedia or nutritiondata.com’s breakdown on purslane. 2 purslane seed pods, close-up. so, obviously i’m not going to eat it right out of the gutter, but reading about its copious seed production, i went down with an envelope to collect seeds. purslane produces little seed pods full of tiny black seeds, and you can shake or pinch them into an envelope for collection [there are 2 in the photo above, along the center horizon of the photo]. once that was done, i pulled up a healthy cluster, and took 5″ cuttings of new stems to plant in my herb garden and in little propagation pots. one way or another, i’m getting in on this plant. hopefully i can grow it from hanging pots right outside my front door. comment if you want some seeds! I adore purslane and would love it if you saved me some seads! Here in NYC they charge a fortune for it in the greenmarkets, while upstate it grows like weeds. I’ll be back in the ‘hood in a couple of weeks. no problem, sanae! i’ll keep collecting them as they create more pods. I love your Mohawk Bend site. Wanted to see your personal site and portfolio for inspiration while building my own and found out the “weed” I am constantly fighting in the yard is a hidden gem. Awesome! The ants swarm that stuff I assume because of the water? Thank you for the information and inspiration, I really like your design skills and approach. Your logos and the icon set for MB came out really nice! thanks so much, zacch! i hope you enjoy your purslane, and i’m sure you’ll make a great site!